Fort Point Boston Blog: Boston Shines Saturday, Please Come! It's that time of year again. Thanks to Cam for organizing again. It's always a good time and the neighborhood looks great afterwards. 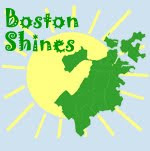 Photos from last year's Boston Shines. 2 meeting locations: Barlow’s and 300 Summer St.
Goodies from Flour Cafe, Franklin Cafe, Mamtaz Gourmet, Sagarinos, Southie Liquors, and Sportello. Additional support from USPS, Cheryl Tougias, Pat Costa. Questions or suggestions? Please email: cam.zin@verizon.